Habitat: A waif in newly seeded lawns probably from contaminated grass seeds. 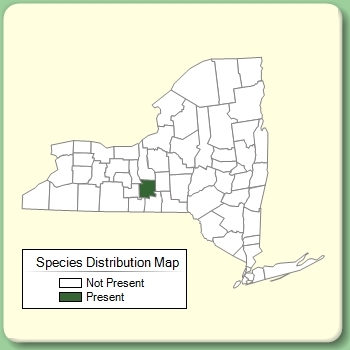 Plant Notes: This taxon is part of a whole series of waifs that were collected primarily from lawns on the Cornell University Campus in Ithaca, New York from 1932-1937 but primarily from 1932-1933. These taxa were probably introduced in contaminated seed. The main collector was S.H. Burnham. Other collectors who collected these waifs include M.W. Allen, H. Clap, W.C. Muenscher, C.A. Taylor Jr., and K.M. Wiegand.